When eggs and bacon start to get old, dig into some Low Carb Breakfast Casserole to change things up with different meats and veggies! We perfected the ratio of eggs to meat to veggies for you in this recipe so there is no guess work. You can even double it for a bigger group or for leftovers that will last up to a full week in the fridge! Watch me show you how easy it is to make below. When it came to the fillings for this breakfast casserole Matthew and I could only agree on sausage and cheese. He was insisting on broccoli while I was dead bent on bell peppers. After trying it I am SO glad we chose broccoli. Not only is it better for you nutritionally, but it is extremely filling and cooks perfect in the oven. Either way you choose to go, however, you can't go wrong with the base of eggs, sausage and cheese! What Are The Best Low Carb Breakfasts? Matthew is the biggest fan of breakfast foods I've ever met. He could seriously eat it for every meal for the rest of his life. So if breakfast casseroles aren't your style, fear not, because we have a variety of breakfast recipes to choose from. You could make our Keto Macro Cakes, Keto Oatmeal or Low Carb Cereal version of cinnamon toast crunch! If that's not enough and you're also looking to perfect some of your breakfast cooking skills, have your hand at our French Omelette recipe - it's all about the technique! We kept our casserole pretty simple with one meat, one veggie and cheese. You can opt to go all out on the veggies which will up the carbs, or go crazy with different meats for a more filling, fatty casserole. The beauty of any casserole, whether breakfast, lunch or dinner, is that you can toss together whatever you have left in the fridge, add a binding agent such as eggs or any form of cheese and bake! Our low carb breakfast casserole is the easiest breakfast you'll make this weekend! 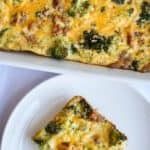 Recipe can be quickly added to MyFitnessPal - Search "KetoConnect - Low Carb Breakfast Casserole"
Remove casing from sausage and crumble into a medium high heat skillet. Once the sausage is almost fully cooked toss in the chopped up broccoli and minced garlic cloves, and cook for an additional 2 minutes (until broccoli turns bright green). As the sausage and broccoli are cooking add the eggs, coconut milk, heavy whipping cream, seasonings and half the cheese (1/4 cup) to a bowl and combine well. Once the broccoli and sausage are done cooking transfer them to a 10x6 casserole dish and make a flat layer. Pour the egg mixture over top as evenly as possible. Sprinkle the rest of the cheese over top oft he casserole and bake at 350 degrees fahrenheit for 35-40 minutes.